I think people are kind of underestimating what just happened. - We are now starting a superstar, 2 star level sidekicks and 2 elite role players one of whom might actually be a star (Siakam). - We are starting 5 guys who can all defend their position (2 former DPOYs), shoot the ball from outside, make plays for others and have extremely high basketball IQ. - We have legitimate championship pedigree on the roster and significant playoff and international experience. People can go on about how efficient JV was but the reality is he presented a lot of the same problems DeRozan did in that he's a major defensive liability and at times it's legitimately hard to keep him on the floor (which is why he only plays 19mpg now). We have no such players in the rotation at the moment. This is huge. AND we got rid of CJ, his contract, and those god awful GoDaddy commercials in the process! Lowry and Gasol played together in Memphis back in the day too. But if we look at this season JV actually protected the rim A LOT better than Marc. JV is at like 67% where Marc is at 49% and they're both slow so neither can guard on the perimeter well. I like that he's still solid defensively (shows in his DBPM and DRPM numbers).. that's a big upgrade. But he's not a good shooter at all (54% TS, 34% from 3). And I don't consider him a star anymore.. Memphis sucked so bad the last couple of years. A "star" shouldn't let that happen. And he had Conley back this season too. He's not washed up like Dirk or Melo are... but he's also not as good as he used to be. His injuries might be catching up to him fast. It is very clear that Massi is putting huge hope in this playoff. He is doing many gambling right now, but there is not a major difference between Marc and JV. I do believe that JV is more dynamic than Marc. On the other hand, when you bear in mind the lose of D Wright, then it is a major black hole in the PG side. This trade will hurt us in the playoff. Last two years the grizz started off well. (Two years ago they beat Golden State twice) but they're too thin and Conley and Gasol have to carry the offense. They wear down, and the team starts to lose, and they check out as the team tanks. Now they wear down because they're not 26, but that load is ridiculous. 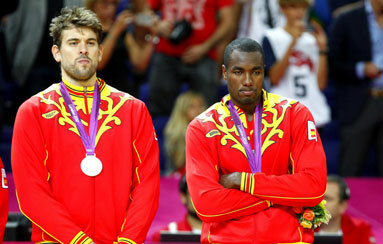 I like what Nurse did with Ibaka and I think he'll do the same with Gasol. We'll see a good player here. Last edited by Mitchell Duong; Thu Feb 7th, 2019, 07:06 PM. Yeah he has that crafty veteran and cool demeanor that really helps when the games are tight and the tension is high. Plus lowry's window is closing just as fast as gasols is so the time is right now. What's scary about this isn't going to be the shot off the pop. It's going to be the pass that happens after the defense scrambles to recover. People are going to be getting dunked on hard by a cutting Kawhi or Siakam. I hope the Gasol/Siakam chemistry happens quick and rims get wrecked.